There was huge excitement in our house yesterday morning. I rushed downstairs to see why my children were running around screaming and yelling. For those of you who don't know, Jesse is a huge Jonas Brothers fan. It is his life goal to BE a Jonas Brother (Nick in particular)! 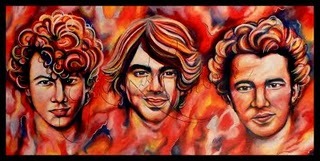 For his birthday Jenna painted him a beautiful painting of ... wait for it ... the Jonas Brothers. She put it up online as she does with all her art and it has caused quite a stir. To cut a long story short, she has been asked by the publishers of the Jonas Brothers Magazine if they can publish it. Now all she has to do is secure a meeting with them so that Jesse can meet them too.